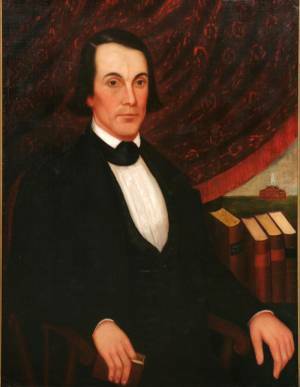 The Reverend John Barker was the only foreign-born president of Allegheny before the millennium. He also was the only president in that span to die in Bentley Hall. Barker further holds the distinction of being the first environmentally minded head of the institution. Born in Foggathorpe, Yorkshire, England, on March 17, 1813, Barker immigrated at the age of three years when his family settled in central New York State. A scholarly youth, he graduated from Geneva College (now Hobart-William Smith) in Geneva, New York, by the time he was eighteen. He then taught pri­vate school for four years, during which period he joined the Methodist Episco­pal Church and ob­tained a license to preach. He taught math­ematics for five years at Genesee Wesleyan Seminary in Lima, New York, and accepted appoint­ment as vice president and profes­sor of natural philos­ophy and chemistry at Allegheny in 1840. He soon chaired the trus­tee committee that countered the complaints against the College submitted to the Pennsyl­vania Senate by Sophia Alden. Barker gave the commencement address in 1843 and taught at the local acade­my in the ensuing months while the College was closed. Upon its reopening in 1845, he was in charge while Presi­dent Homer J. Clark canvassed for funds. Dish­eartened by low en­roll­ment, Barker left in March 1846 to teach ancient lan­guages at Transylvania Uni­versi­ty; that institution soon grant­ed him an honorary Doctor of Divinity degree, as did Washington College in Pennsylvania. President Homer Clark’s resignation brought about the prompt elec­tion of Barker to the presidency of Allegheny. Warmly welcomed as a devout, pleasant, and humble person, he was a teach­er at heart and reveled in the reci­tation room. As president he believed he should teach as much as the regular faculty; he therefore assumed a heavy load. As exec­utive, the small, sprightly, and gentle Barker gov­erned more by love than by fear. His term was char­acterized by harmony and little change among the faculty. Concerned by the starkness of the cam­pus, he encour­aged arbor days, during which students planted trees and shrubs brought from the neighboring woods. Undergraduates poked fun at Barker’s eccen­tricities but adored him for them. The students estimated he could speak extemporaneously on any subject. It was said that if Barker came to class rubbing his hands, the learners knew they would receive apt illustration and witty comment. If he approached with thoughtful stride and hands behind his back, they steeled themselves for a session of tough, probing questions. Barker read widely and possessed a retentive mind. Person­al charm, joined with a broad range of know­ledge and inter­ests, made him an excep­tional con­ver­sa­tional­ist and ad­viser. His playful wit enabled him to induce laughter from any audi­ence. He brought a new style to the presidency and gave the College a congenial aura before stu­dents and com­muni­ty. During these years nearly all the faculty and many students supported the Know Nothings, a secret party that opposed the alleged political influence of Roman Catholics and immigrants and locally, at least, criticized slavery. As an immigrant, Barker was excluded. On the hot sectional issues of the day, he was conservative. Barker feared that northern atti­tudes, John Brown’s raid at Harpers Ferry, Virginia, and the abolitionist sentiments within the Methodist Episcopal Church would jeopardize national and ecclesiastical unity. His plan to argue against extremism at a General Conference of the Methodist Church was cut short by his death. During Barker’s tenure, the number of students increased, though the majority were preparatory students and attri­tion remained high. Classical and Biblical stud­ies received extra emphasis; offer­ings in science and modern languages were spotty. Completion of Ruter Hall in 1854 finally provided the College with sufficient new space to enable Barker to move his family into the east wing of Bentley Hall. He later shifted the family rooms to the west wing, where he died early on February 26, 1860, following a stroke he endured while critiquing essays in his chamber the preceding eve­ning.